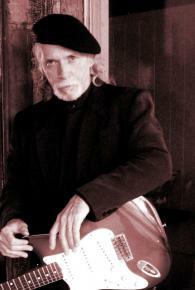 David Daniels was born in 1955 when some of the most historic Blues songs were born. He waited a long time to get his music to all his fans, and he hopes you will all enjoy this ride through time. David was born in a Dog Trott house in T County as we call it around here. That’s Tipton County to be correct. He started playing his brother’s Harmony acoustic guitar upside down at the tender age of 10. Yes, he's a south paw and thats’s what felt right to him. The first Blues song he heard wasn’t where you might think. It was on a Yardbirds’s album in 1969, and the song was “New York City Blues” with Jeff Beck playing guitar. So right from the beginning, David knew the guitar was a powerful voice to be heard. David borrowed a Fender Mustang and really got serious wood shedding and learning his instrument, because there weren’t anyone around that could teach upside-down guitar playing in Memphis,TN. In 1973, David traded his 1950s Fender MusicMaster for an old Gibson SG Special, and things got fired up for the young 18 yr old. In 1976, David moved from Dallas to Houston,Texas in 1980, and then finally settling down in Corpus Christie in 1982, playing guitar for a living all over Texas. On one occasion, in 1983 David Daniels was playing in Corpus Christie Bayfront Auditorium, and Stevie Ray Vaughn was next door at the Bayfront Coliseum. David took that as yet another omen calling him to play the Blues again. You know things are BIGGER in Texas, and so were the venues for music. David came back in 1986 to Memphis, and he survived the many changes that occurred with music at the time, but never forgot about the Blues which held a special place in his heart. In 1983, the revived world-famou Beale Street was starting to grow, and David wanted to do his part to rebuild the Blues. He went on to play with James Govan, Joe Turner, Mojo Buford of the (Muddy Waters Band ) and many others along with doing his own Blues. In 1990, David along with Brad Webb, Tony Adams and Dan Cochran played on Beale Street as White Lightning rocking the Blues. Beale Street was on fire at the time, and things weren't quite so commercialized. Groups of tourists would ask "Do you guys have a cassette or CD we can buy? ", but we had nothing at the time.